A View From The Kitchen: Dry aged beef? This past week at the restaurant I purchased some 21 day dry aged bone-in NY strip steaks. The one pound steaks sold like hot cakes, and the small bit I did get a chance to try left me wanting more that is for sure. Was it the best piece of beef I’ve ever tasted, not by a long shot. In comparison I was lucky enough to get a sample of a grain fed, hormone/antibiotic free, locally produced T-bone steak, which Fresh Fork Market will begin to distribute, and I found that much more enjoyable, but that’s not what this post is about. The question of what is a dry aged steak, and why bother came up among the service staff. My original answers of concentrated flavor by evaporation where spot on, yet vague, so I decided to do some more research and this is what I found. 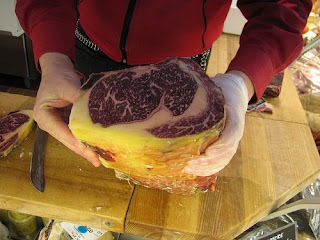 Dry aged beef is that which has been allowed to rest at near freezing temperatures for a minimum of 15 days. Most frequently primal cuts are dried, but half animals might also be hung to age. Dry aged beef is a rare find outside of upscale steak houses because the price is significantly higher than wet-aged, normal beef. This is due to the fact there is significant weight loss during the aging process, the length of the process, and loss due to molding. Up to 1/3 rd of the initial weight of the beef might be lost. The dry aging process enhances the beef by three means. First moisture evaporated from the flesh and the beef flavor becomes more concentrated. 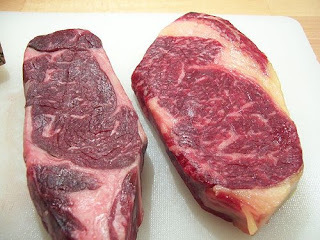 Second, the beefs natural enzymes have time to work breaking down connective tissue creating a more tender steak, Lastly, mold growth, Thamnidia, in particular, is known to produce collagenolytic enzymes which greatly contribute to the tenderness and flavor of dry-aged meat. Is dry aged beef just a romantic tale of taking something good and affordable and making it exclusive and expensive, maybe? The good ole boys bloging on Grocer Guy did a side by side test, here is what they thought. These are a 60 and 30 day dry aged steaks. If nothing else they do look a lot more appetizing that piece of meat swimming in a pool of red liquid. Thanks for the link Dave. I remember the discussion on the cleveland.com food forum about this tasting. I was just to lazy to go back and find the thread. thanks again. It seems far fetched but it works. They have pictures and very good instructions.